MORE FRIENDS, MORE SMILES, MORE MILES…. A staid lifestyle and an urge to get out of the sedentary rut led to an eyeopening “eureka” moment and prompted me to first walk, then jog alone at first and my running journey was born. I continued to then run 5 km distances by myself. July 2012 – Dream Runner’s marathon was my first 10 km event and even my first 10 km long run as it were. 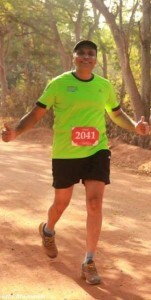 More 10 km events followed and yet I could not find any semblance of courage within me to even dream of attempting 21 kms. be a part of EC Runners ! Practice sessions became routines to look forward to, what with friends both old and new around to give me company and I was motivated not to miss any such regimen when I was in town. Running distances increased as did going through the nuances and drills of stretches and running related strength training etc..
Subsequently,with the able training of Dream Runners who hand held us at every stage, our progression was ensured every step of the way.Dream Runners’ training style is effective and inclusive. Before I knew it, after the group training sessions that began in March 2014, I actually was able to run the Dream Runners’ half marathon in June 2014. But all this while, it was not only my running distance that was scaled up , but I had made so many friends in the process. My regularity was primarily because of the company that I could look forward to, and my running, for whatever it may have been worth, had improved,solely due to the practising together with my running friends. One feels alive after a group running session and energized after a group drill,revitalized on the whole! No run is complete without company prodding you to run that extra mile and go on until a target higher than planned is achieved and inexorably a new milestone is covered !!! A running group provides that amount of motivation without which distances appear daunting but in the company of whom long distances seem comfortable what with all the chatting and camaraderie during the run.Most importantly,safety is also ensured while running in a group. More women, children and even families can thus come forward to running in groups. Such is the magic of group dynamics and group vibration and above all else, group camaraderie. An interesting conversation and friendly company and the assurance of safety is all it takes and before one realizes it, miles are just numbers transcended over smiles. We not only meet for practice sessions but also go out together regularly on social occasions. More friends, more smiles, more miles…Keep smiling ! Keep running ! !